While a lot of changes are coming, there’s a lot about Destiny 2 that will remain familiar to players. 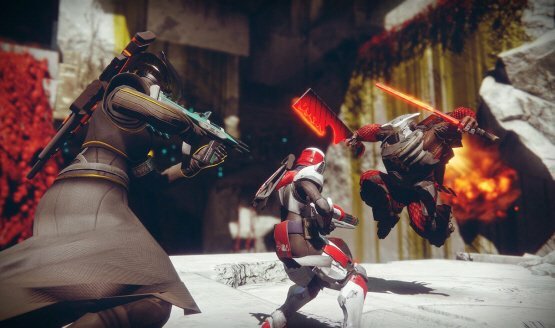 Strikes are making a return, and for all of you who haven’t played Destiny, just think of a Strike as a tougher side mission culminating in a difficult boss fight. Strikes in Destiny started off fairly dull in year one, walking through waves of enemies until you are met with a bullet sponge boss. Later strikes sought to change the formula and really make them fun to replay, adding in various obstacles, challenges, and objectives to complete. 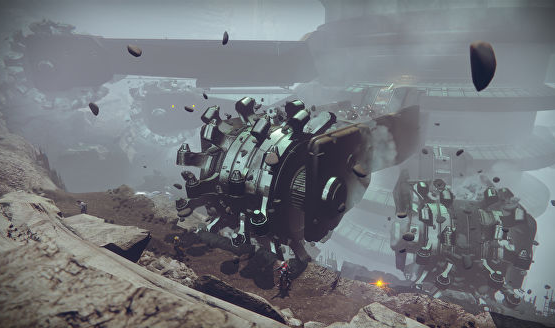 Many came to think of them as a good Raid precursor as they utilized some of the same mechanics that might be involved in Destiny’s grand end game content. At the Destiny 2 gameplay reveal, I was able to go hands on with a new Strike in Destiny 2 called The Inverted Spire. Unlike changes to the Crucible, Strikes remain three-player fireteam affairs. It gave me a chance to get a feel for Destiny 2’s new world Nessus, which is a lot like Venus in that it has been taken over by the Vex to be turned in to one of their machines planets. It’s a beautiful world mixing the Vex architecture with the red flora that covers the landscape, and one that I can’t wait to dive into more. The Strike itself felt very familiar, as much of Destiny 2 did. There was nothing groundbreaking or vastly different about it, though it did have some fun environmental interactions and obstacles to help break up shooting waves of enemies. Different areas present different gameplay challenges, whether it’s being in a tight space dealing with the Red Legion, or in an open area being sniped by Vex, but again, it’s nothing different than what I am used to in the hundreds of Strikes I’ve completed in Destiny. One portion adds a massive Cabal drill that I needed to avoid as being hit by it results in an instantaneous kill. Fighting through this section required me to stay on my toes and added a new intensity that standard waves of enemies just don’t have. If They continue to play with the environment in this manner and add some interesting mechanics that require players to think and have increased awareness, I’ll consider it a solid win for Destiny 2’s Strikes. The final boss of the Strike is a three-part battle, and as I whittled down Protheon’s health, the floor beneath me de-materialized and caused us to full to a new arena. It did this twice before settling on an island in the middle of what appeared to be charged Vex milk. Despite the title “Modular Mind,” Protheon never changed form. Nothing special was required to kill the boss except staying alive, fighting off waves of Vex, and lobbing damage his way, but it felt like Destiny, and that to me is a great thing, even if this one Strike did present some missed opportunities. One of my favorite parts of the Strike was flying through a boosting ring, slamming into a wall, and dying. I’m not kidding! It made me smile to realize that some of Destiny’s silly physics made it over to the sequel. Turns out you can’t jump through the boost ring. I had to walk through it and then not jump or anything in midair, lest I become a smear on the Vex wall. It’s similar to an effect on a Crucible map in Destiny. What The Inverted Spire proved is not that Destiny 2 is some radical new monster. It demonstrated that Bungie did not want to alienate their fanbase. Destiny is a wildly successful title, and changing it too much may have been a problem. While I’m happy that one of my favorite games is going to feel the same going into the sequel, there’s a part of me that really wanted to see what made Destiny 2 earn its number. We still have a lot to see before release though, and considering some of the things we haven’t seen yet, the hands-on felt like it was just to reassure Destiny fans that their game still looked and played largely the same. What the Strike was really able to do was give a sense of some of the new gameplay. I played as a Striker Titan, which is quite different from the Titan that I am used to playing. Instead of a single smash, the Striker now has a roaming super, allowing you to smash again and again as time allows. You can also shoulder charge enemies while it is active to kill them. It’s an interesting change, and if the other subclasses follow suit, we may see that everyone gets roaming abilities instead of a single use super. To me that partly takes away from the risk reward of choosing different subclasses, but it also provides accessibility to newcomers by allowing for less nuanced subclass abilities and making the primary differences be from class to class. Each of the classes — Titan, Hunter, and Warlock — now has a class ability that persists regardless of subclass selection. Titans get a shield to put up, Hunters have their shadestep dodge ability, and Warlocks have either a healing or damage boosting aura that they can lay down. These things help to divide the classes but muddy the waters on subclasses and their utility. Obviously it’s very early at this point, so there may indeed be some utility that remains within them, but from what I am seeing now, subclasses are simply what you want to look like when you’re dealing damage as opposed to offering any real difficult choice on which one to choose for a given situation. A lot of these changes are being made to make Destiny 2 more friendly to newcomers, eschewing some of the more complicated systems of the past for an easier to understand build. This may add a lot of intriguing freedoms on subclass usage instead of finding a niche that everyone falls into for each activity, but at first glance it seems that some of the complexity and utility has gone away. I’d like to see them dive into this as they reveal more about Destiny 2, addressing my concerns on this as I lose favorite utilitarian abilities like the Titan’s bubble shield. Destiny 2 previewed at Bungie’s reveal event. Travel and accommodations provided by Activision.